How many times have you looked inside your refrigerator and discovered just a mess where there should be food? The free How to Keep the Refrigerator Clean Template is the perfect tool to help you clean your fridge and help you keep it that way. The free template offers you the customization that you need to finally get your refrigerator in shape this year. You will simply design your own system for organizing and cleaning out the fridge and mark off the items of the list when you are ready to clean. Nothing can be simpler than this template! To try it for yourself, just follow the guide given below. 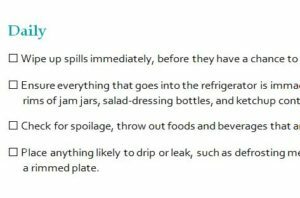 You can download the How to Keep the Refrigerator Clean Template by clicking the link at the bottom of this page. Next, go to the categories items, highlighted in blue. These categories are separated by the frequency in which you clean the items listed beneath them. This way, once you clean a weekly item once, you know you’ll be good for the rest of the week. When you have compiled a complete list of refrigerator cleaning items with your checklist, you can then print the sheet and hang it on the most convenient item in your home, the fridge itself. To print the document, scroll to the top of the page and click the File tab above and select Print from the list of options that will appear. You can change and update this template as you see fit and simply print new sheets when you have used all the sheets you made. This way, your refrigerator stays clean the entire year.